Neo-Nazi and white supremacist fliers have turned up in the driveways of Westport homes for the second time in two years, and police are investigating. The disturbing messages were left almost two years to the day after disturbing flyers appeared in other parts of town, according to Westport police and the first selectman. Neo-Nazi and white supremacist fliers have turned up in the driveways of Westport homes for the second time in two years, and police are investigating. 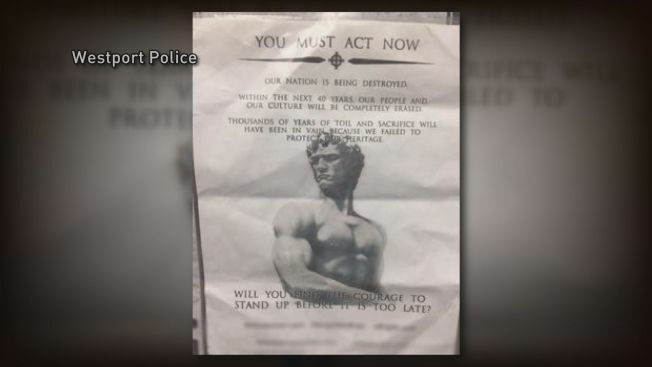 The disturbing messages were left almost two years to the day after disturbing flyers appeared in other parts of town, according to Westport police and the first selectman. Westport police officers are working with area police departments to try to identify where the fliers are coming from. They are asking anyone with information or questions to call the Westport Detective Bureau at 203-341-6080. “At this time, we don’t have any reason to believe that anyone who received one was being targeted,” said Lt. David Farrell of the Westport Police Department. “I am concerned and angry that once again statements like this have found their way to Westport homes. As I said two years ago, this kind of ethnic ugliness has no place anywhere, and certainly not in Westport,” First Selectman James Marpe said in a statement. “I have always been proud to speak of Westport as an open and welcoming community. I continue to believe that the vast majority of Westporters practice tolerance, inclusion and everyday civil behavior. Unfortunately, the last few years and months have reminded us that our nation still needs to deal with some serious societal and behavioral issues. We are reminded that Westport is not necessarily immune from these issues,” he went on to write.